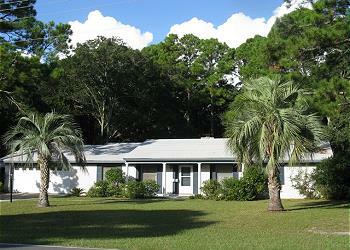 3 bedrooms, 2 bathrooms, living room, dining area, family room, Jekyll room, kitchen, double garage, POOL PRIVILEGES @ DAYS INN. MW, DW, W/D, 2 Cable TVs, DVD, WiFi/DSL, Gas Grill. NO PETS., NO SMOKING. BEDS: 1 King, 1 Queen, 2 Single, sofa bed. Accommodates 8. Loved the peace and solitude. Deer and Racoons in the back yard while we had breakfast. Home was well located and spacious. Furniture could use updating but beyond that, the house was nice. The best part was the large sunroom. The stay was very good as expected. Couple of things unrelated to our stay and of possible concern for JR and or the owner. 1. There is a shingle or two that that has torn loose from the roof. (Possible storm damage). 2. I guess could be stay related, we asked a couple of times to have the bldg. sprayed for cockroaches but never saw anyone come and did continue to see a few of them, mostly dead or dying as I had brought my own spray. On our last day there Vicki saw a live one under the sink that she sprayed and killed so they are still around. We didn't have any problems with them here last year and I know all it takes is one unclean tenant but if you don't already have a terminator scheduled, you may wish to do it. Otherwise we enjoyed our stay at Hollyborne. Overall enjoyed our stay at HOLLYBOURNE II. The home is very spacious and well equipped. Some furnishings could use an upgrade! Home is located on a curve on the main road and you have to be careful backing out of the driveway. Grill could use an upgrade! As always, we had a wonderful time. This is the 3rd year in a row that we have come to Jekyll Island. Every year it seems that as we are leaving one of our granddaughters always ask if we can come back next year. That speaks volume when you consider their ages range from 8 to 16. It is definitely a favorite vacation destination and possibly a future place we are even considering for retirement. If it were up to me I would immediately pack up and move. The folks at Jekyll Realty have always been very accommodating to us and we appreciate that very much. Anytime we have had a problem they got right on it to resolve the issue. Thank you very much. The only issue we had this year was when the trash was picked up, they only emptied one can and left the other one full. From the start Jekyll Realty was great, they were super friendly and very helpful. Our house was completely gorgeous! It was everything and more that was described and pictured. Our family had the most amazing vacation. Even on checkout day the company was friendly and wanted to make sure we had a great experience. Will definitely be calling them again and referring them to our friends and family! We had a great time! The house worked out perfect for our needs. We hope to come back soon and would stay here if available. We were very happy with Hollybourne II. For our family of 8 adults and 1 child it was perfect. There are basically three seating areas so everyone could have their quiet spot when needed. The location is very close to beach access.We did have an ant problem but the management company sent people out twice and took care of it. Bathrooms were not as clean as I would have liked and the double bed room has many dirty areas on the walls, but these are minor things during a one week stay. We enjoyed staying at Hollyborne 2, very close to the beach, clean, furniture could be updated. Was uncomfortable on a rainy day watching tv. But usually we were outside, busy enjoying the island. Everything else was great! Oh, the garage door broke first time we opened it. Never got it fixed while we were there. ...outside of house needs cleaning, cob webs, leaves, not the yard, the house itself. But, like I said, not a huge issue.